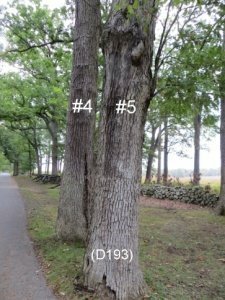 What is a Gettysburg Witness Tree? 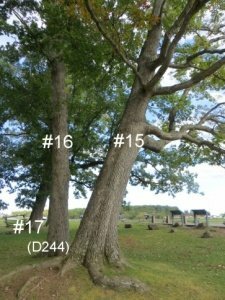 It is a tree that is old enough to have “witnessed” the Battle of Gettysburg, July 1-3, 1863. 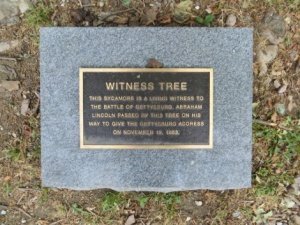 What is a Gettysburg Witness Tree? 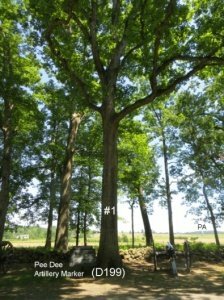 In the case of the Battle of Gettysburg, a “witness tree” is a tree that was alive during the battle. Although there is no official count or record of the park’s witness trees, some trees are tagged with round, metal markers (that turn green due to oxidation). Typically, the tags are nailed a few feet above human reach, but still readable. All photographs were taken between October 2015 and June 2016, and those images are the source of the GPS coordinates that I provide. 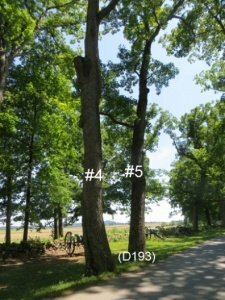 In 2008, the Gettysburg Daily website posted a series of articles on Gettysburg Witness Trees. 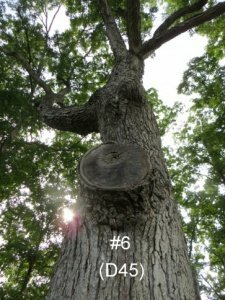 These articles started me on my witness tree hunt, and I highly recommend them. 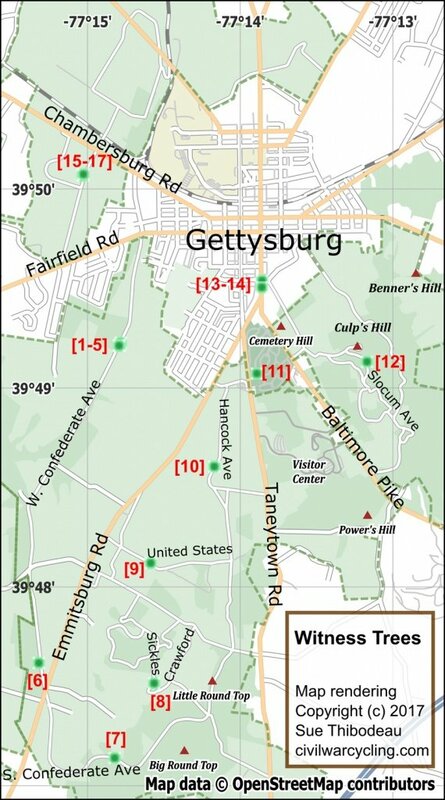 A bicyclist can find the first ten witness trees by touring Seminary and Cemetery Ridges. Please see the high-level map to the left. Photographs, GPS coordinates, and brief historical summaries are provided in later sections of this article. Start at the north end of West Confederate Avenue and head south along Seminary Ridge. Look for a cast iron sign for McMillan Woods on your right, about one-half mile south of Fairfield Road. Witness trees #1-5 are grouped together in a line on the left side of the road, across from McMillan Woods. These trees would have “witnessed” the cannonade that pounded the Union line before Pickett’s Charge on July 3, 1863. 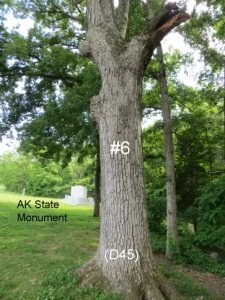 Follow West Confederate Avenue south to visit tree #6 near the Arkansas State Monument, on the right. 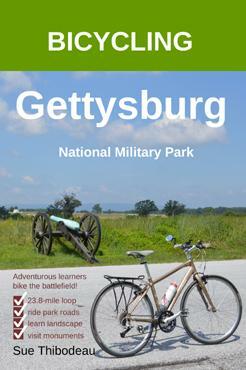 Then cross Emmitsburg Road. You are now on South Confederate Avenue. Tree #7 is on the left side of the road before the historic signs that describe the Farnsworth cavalry charge. 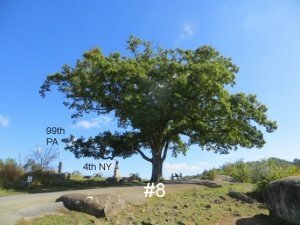 Use a park map to find your way to the Devil’s Den (#8), Sickles (#9) and Gibbon (#10) witness trees. 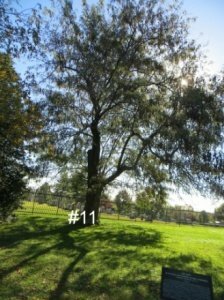 Whereas you may want to visit tree #11 immediately after #10, getting to the remaining six trees is problematic for bicyclists who prefer the safety of park avenues to town streets and commercial traffic. The two trees on Baltimore Street (#13-#14) are best visited while visiting shops and restaurants in downtown Gettysburg. 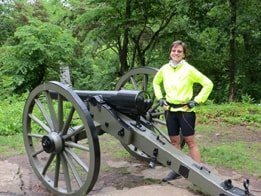 The trees on Culp’s Hill (#12) and McPherson’s Ridges (#15-17) are more easily visited as part of a separate bicycle tour that focuses on either Culp’s Hill or battlefield sites north(west) of town. 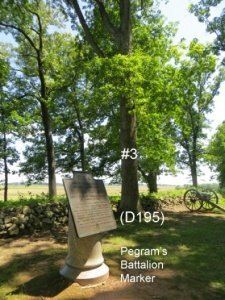 What is a Gettysburg Witness Tree? Here are seventeen of them! “ARMY OF NORTHERN VIRGINIA, HILL’S CORPS, ARTILLERY RESERVE, PEGRAM’S BATTALION, ZIMMERMANN’S BATTERY, THE PEE DEE ARTILLERY.” The tablet says that the artillery unit had four three-inch rifles. The modern-day placement of four cannons near the tablet (and the tree) is deliberate. 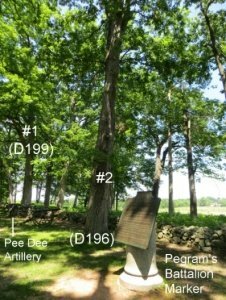 D199 (#1) would have witnessed the battle preparations of a distinguished Confederate battery from South Carolina, known as The Pee Dee Light Artillery (part of Pegram’s Battalion). The unit was led by Lt. William E. Zimmerman. D196 (#2) — and the next tree south, D195 (#3) — are Pender Witness Trees, although D196 more often gets that attribution. The trees mark the general location that William Dorsey Pender (1834–63) was mortally wounded on July 2, 1863. Pender was one of the youngest generals in the Confederacy, promoted by Lee to major general at the age of twenty-nine. When cannon fire from Cemetery Hill struck Pender in the thigh, his division’s assault – timed to continue the wave of Longstreet’s assault from the right – was flattened for lack of effective leadership. Pender was evacuated from the battlefield and died from his wounds on July 18. He was buried in his home state of North Carolina. 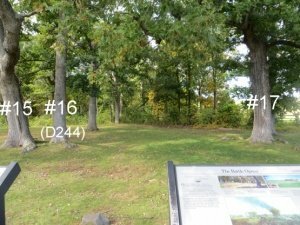 D195 (#3) is the third witness tree along the left side of West Confederate Avenue, across from McMillan Woods. It is on the right side of the Pegram Battalion Marker, and only a few yards south of D196 (#2). Some people identify this tree as the Pender Tree; others identify D196 (#2). The next photograph is a view of both trees, looking to the north. (West Confederate Avenue is on the left.) Note the green “lightning cable” installed by the NPS to protect the tree. 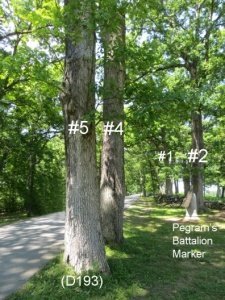 These trees would have witnessed the boom of Confederate cannons under command of Maj. William (“Willy”) Pegram, a young man from Virginia rumored to be the best gunner in Lee’s army. When the Civil War erupted, Pegram was a law student at the University of Virginia. Pegram survived Gettysburg, only to die in one of the last battles of the Civil War (the Battle of Five Forks, April 1, 1865), at the age of twenty-three. 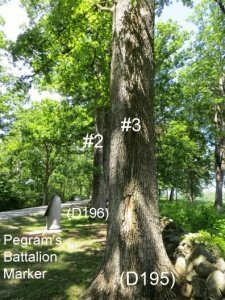 The last two witness trees in the area of Pegram’s Battalion are tree #4 and D193 (#5). According to the battlefield marker, the battalion shot 3,800 rounds; thirty-eight horses were killed or disabled; and ten soldiers were killed and thirty-seven wounded. Both trees stand several yards west of the stone wall that borders the road. The following photographs show their proximity to the road to their closeness to each other. When looking southeast through both trees, Big Round Top is visible in the distance. Tree #4 has a scar on its northern side from a lightning rod cable. 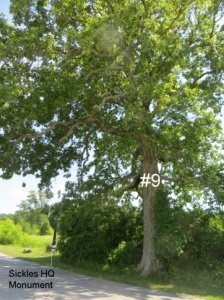 The identification tag for this tree is missing, but the tree can be identified as the first tree north of D193 (#5). Witness Tree #5 (D193) is one tree to the south of #4. While bicycling south on W. Confederate Ave, if you reach the Crenshaw Battery Marker (on your left) – also part of Pegram’s Battalion — or the Brockenbrough Brigade Marker (on your right), then you have gone too far. From this spot, the 3rd AK Infantry participated in the successful Confederate attack on Devil’s Den on July 2, and skirmishing near Big Round Top on July 3. Tree #6 (D45) is relatively easy to identify, especially because of its distinctive shape and knotty protrusions. Unfortunately, in recent years the tree’s health has become questionable. It remains standing as of this writing. “Another Slowly Dying Gettysburg Witness Tree,” Gettysburg Daily, August 27, 2008, accessed February 22, 2016, http://www.gettysburgdaily.com/another-slowly-dying-gettysburg-witness-tree/. 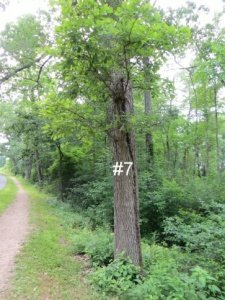 The Farnsworth Charge Witness Tree (#7) has a green cable (a lightning rod) in its bark. The tree is located on the north side of South Confederate Avenue. It is to the west of the historic signs that overlook Slyder Farm. The NPS signs describe the disastrous cavalry charge of Brig. Gen. Elon J. Farnsworth (1837-63), a native of Michigan, against Confederate positions south of Devil’s Den. The twenty-five year-old Farnsworth was recently promoted to command the 1st Brigade, 3rd Division, Cavalry Corps for the Army of the Potomac. He died on July 3 from five chest wounds. Over the years, the Farnsworth Charge Witness Tree has been badly damaged by storms. Its shape changes as the NPS trims dead branches, which although good for the tree, is difficult for tourists. To help with identification, this book offers photographs from different vantage points. “Searching for a Farnsworth’s Charge Witness Tree,” Gettysburg Daily, September 8, 2008, accessed February 22, 2016, http://www.gettysburgdaily.com/searching-for-a-farnsworth-charge-witness-tree/. The Devil’s Den Witness Tree is near the 4th NY Independent Battery Monument. A seedling during the Battle of Gettysburg, the tree is visible from Little Round Top, which towers to the west, beyond what is now called The Slaughter Pen. This Oak tree witnessed the brutal clash of about 2,400 Union soldiers (under David B. Birney) and 5,500 Confederate soldiers (under John B. Hood), which was the first wave of Longstreet’s assault on July 2. The attack began at about 4 p.m. In the end, the Confederates captured this rocky area but suffered about 1,800 casualties, including the wounding of Hood. 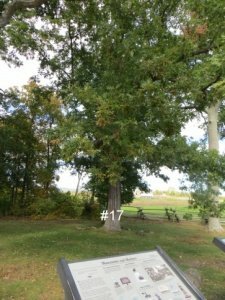 Could this White Oak on the Trostle Farm have witnessed the wounding of Maj. Gen. Daniel E. Sickles (1819–74), commander of the Union 3rd Corps, when a cannonball tore through his right leg? Sickles’ leg was amputated on July 2. It is preserved at the National Museum of Health and Medicine. Sickles remained in the army until the end of the war and sponsored legislation to preserve the battlefield as a national military park. The Sickles Witness Tree stands a few yards from the Sickles Headquarters Monument. It is located on Sickles’ exposed right flank that extended from the Sherfy Peach Orchard. This Black Walnut may have witnessed the wounding of Union Brig. Gen. John Gibbon, commander of the 2nd Division, 2nd Corps (Hancock). Gibbon was wounded in the left arm and shoulder during Pickett’s Charge to Cemetery Ridge. Like many Union officers, Gibbon had four brothers who served in the Confederate army. He was born in Philadelphia, raised in North Carolina, and educated at West Point. “General Gibbon’s Walnut Tree,” Gettysburg Daily, May 27, 2008, accessed February 22, 2016, http://www.gettysburgdaily.com/general-gibbons-walnut-tree/. 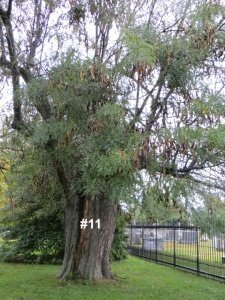 In Soldiers’ National Cemetery, on the high ground of Cemetery Hill, the Honey Locust Witness Tree (#11) is nestled among cannon and monuments to artillery units. Union batteries from Maine, Massachusetts, Ohio, West Virginia, Minnesota, New York, and Pennsylvania fought here. The tree stood on this hill when President Abraham Lincoln delivered his Gettysburg Address on November 19, 1863, at the dedication of this first United States cemetery on a battlefield. The tree is near an iron fence that Maj. Gen. Sickles had transferred from Lafayette Park, Washington, D.C. – the site where (before the war) Sickles had killed the son of Francis Scott Key for having an affair with his wife. 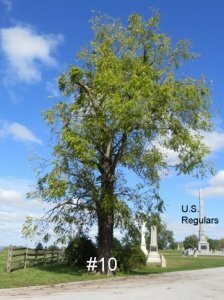 (Sickles was the first person in the U.S. to be acquitted of murder under the defense of “temporary insanity.”) Badly damaged from recent storms, the National Park Service is trying to keep the Honey Locust alive. 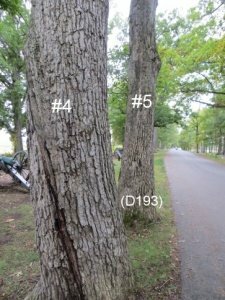 “Gettysburg Witness Tree Damage Update: Sickles’ ‘Witness Fence’ Damaged,” Gettysburg Daily, August 12, 2008, accessed February 22, 2016, http://www.gettysburgdaily.com/gettysburg-witness-tree-damage-update-sickles-witness-fence-damaged/. 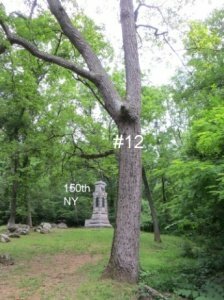 The God Tree (#12) is a White Oak located on Slocum Avenue, on the road up to Culp’s Hill. 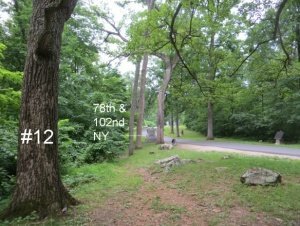 It is on the right side of the road, north of the 78th & 102nd NY Monument and south of the 150th NY Monument. Traditionally, a “god tree” is a massive tree whose earthen base has been soaked in the blood of war. I do not know if that is the origin of the nickname for this particular White Oak, but it seems plausible. 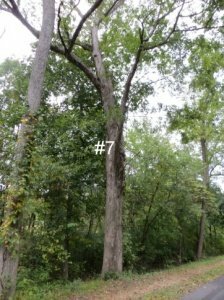 “Culp’s Hill Witness Tree: Photographed by M.B. Brady and Company,” Gettysburg Daily, December 5, 2008, accessed February 22, 2016, http://www.gettysburgdaily.com/culps-hill-witness-tree/. 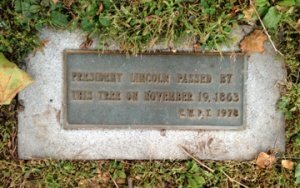 President Lincoln would have passed tree #13 on his way to deliver his Gettysburg Address at the dedication of Soldiers’ National Cemetery on November 19, 1863. A plaque that commemorates that fact is mounted on a stone at the base of the tree. On the previous night, prior, Lincoln stayed at the home of local attorney David Wills, who lived on what is now called Lincoln Square, in downtown Gettysburg. 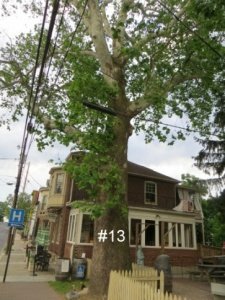 Tree #13 is a Sycamore that is on the east side of Baltimore St, near the intersection with Lefever Street. This is a busy downtown area that is north of Cemetery Hill. Lincoln traveled from the Wills House, south on Baltimore Street (passing this tree), and arrived at Soldiers’ National Cemetery, where he gave his Gettysburg Address. 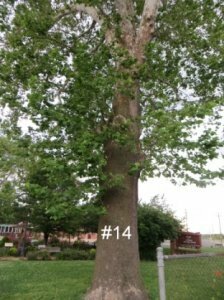 Tree # 14 is a Sycamore that stands is near “Unity Park,” a small memorial space on Lefever Street. The tree is marked with a plaque at its base. This second Lincoln witness tree is on the east of Baltimore Street, south of its intersection with Lefever Street. Unity Park is a few yards north of the tree. It can be seen on the left side of the photograph, in the distance. The Gettysburg public school complex is on the right (not visible). “Abraham Lincoln Witness Tree,” Gettysburg Daily, November 19, 2008, accessed February 22, 2016, http://www.gettysburgdaily.com/abraham-lincoln-witness-tree/. Civil War fighting in McPherson’s Woods was witnessed by three trees. In our first photograph, the camera is facing west, near some historic signs on the west side of South Reynolds Avenue. We are facing the same direction that Union cavalry and army were facing the morning of July 1, 1863. The Confederate army assaulted Reynolds’ infantry and Buford’s cavalry through these woods. To the left (south) of tree #15 — and out of view for the photograph, above — is a monument that marks the location that Maj. Gen. John F. Reynolds was killed on July 1. The second was taken facing north. South Reynolds Avenue is on the right, but only faintly visible. Oak Hill is in the distance. Reynolds was killed behind the camera. The third photograph faces northwest, toward the McPherson Barn and Chambersburg Road.